Dr. Dunleavy specializes in orthopaedic sports medicine, advanced arthroscopic rotator cuff repair, arthroscopic shoulder labrum repair, arthroscopic meniscus repair and preservation, arthroscopic hip labrum repairs, femoroacetabular impingement (FAI), arthroscopic treatment of hip bursitis and tendinopathy, “all-inside” arthroscopy-assisted ACL reconstruction, cartilage preservation and reconstruction techniques, microfracture, shoulder impingement, arthroscopic biceps tenodesis, tendinopathy, fracture care, and general orthopaedic surgery. While at the University of Chicago, Dr. Dunleavy assisted and trained under the team physicians for the NFL Chicago Bears. 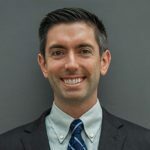 He also served as a team physician for the MLS Chicago Fire soccer team, University of Chicago sports teams, and local high school football teams. In his spare time, Dr. Dunleavy is an avid sports fan, and enjoys baseball, golf and tennis. Most of all, he enjoys spending time with his wife and daughters.